"The DDoS is killing our business. We have a challenge with the DDoS. We are hoping someone can stop it. It's killing our revenue. Our business has frequently been targeted" an employee with one Liberian mobile service provider told PC World. "At first I thought it was a problem with my internet provider, which often suffers from slow speeds. But this feels more serious. Even when you do get online, the connection repeatedly cuts out." BBC Africa's Jonathan Paye-Layleh in Liberia shared his experience. Of course, based on the high concern, the story went viral and Kevin's research was covered by other media outlets, including BBC, PC World, The Guardian, Forbes, IBtimes, Quartz, Mashable, although few of them interpreted the incident incorrectly and claimed that the attack took down the entire country's Internet. 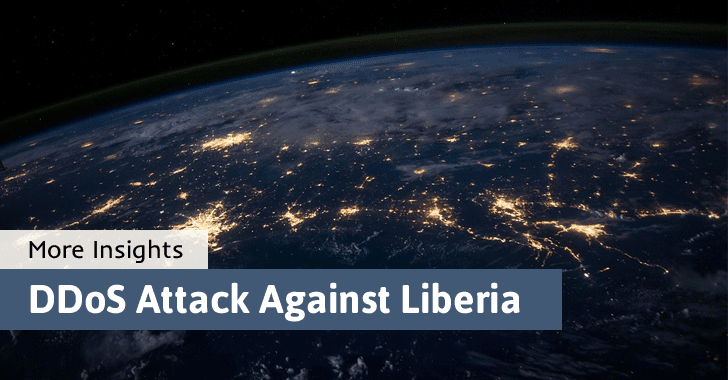 The Hacker News has also been contacted by Kpetermeni Siakor, who manages infrastructure at the Liberia Internet Exchange Point, stating that only Lonestarcell MTN, one of the country's four major telecommunication companies, faced 500 Gbps of DDoS attack for a short period, which was mitigated successfully. "From inspecting our logs at the Liberia IXP, we didn't see any downtime in the past three weeks. The general manager of the CCL also couldn't confirm any issues with the ACE cable," Siakor said.